Much has been written and photographed and portrayed about the Stars and Stripes, and yet author Sarvinder Naberhaus sums up its appearance in eight short words. But our flag is much more than a graphic combination of stripes and stars on a blue field, interestingly called the "union." Yes, the colors, red, white, and blue, have a meaning in the traditional language of symbolism; the stars represent the fifty states; and the stripes represents the original colonies that came together to gain our liberty. And that is where award-winning artist Kadir Nelson comes in, with his realistically crafted images of what gives the flag its many meanings--the Statue of Liberty, our brilliant autumn trees, snowy mountains, and ocean waves, but also the face of Abraham Lincoln, a Mars moon rover, a crowd upholding signs and freedom of speech, the flag proudly planted on the moon, and a baseball field, a rocket launch, Betsy Ross sewing a brand-new flag, a soldier standing with pride at his post, a girl in a graduation gown standing with pride at a podium, and most of all, our faces as we watch the flag going up before us. 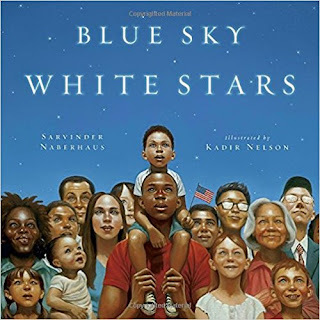 The flag is a symbol, and more than that--it is one of those things that unite our experience as citizens, in Naberhaus' Blue Sky White Stars (Dial Books, 2017). This is a book for any national holiday, with some of the iconic experiences of our history portrayed to make us think about the values shown in the background illustrations, conceived and executed in striking artwork that inspires close examination.